The regimen of obinutuzumab (Gazyva), ibrutinib (Imbruvica), and venetoclax (Venclexta) can be safely given as initial therapy for chronic lymphocytic leukemia (CLL), according to preliminary results of a phase II trial of treatment-naïve patients. This triplet produced objective responses, including minimal residual disease (MRD)-negative complete responses in all patients to date, noted investigators. Of 24 evaluable patients at the time of reporting, the complete remission (CR) rate, including CR with incomplete marrow recovery, was 50% (n = 12). MRD-negative status in the blood and bone marrow was observed in 14 patients (58%). Adverse events (AEs) were consistent with what was seen in the phase Ib study in relapsed/refractory patients, says principal investigator Kerry A. Rogers, MD. Overall, this regimen has been shown to be tolerable in treatment-naïve patients. 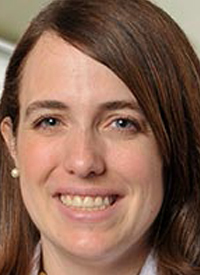 In an interview with OncLive, Rogers, assistant professor of internal medicine in the Division of Hematology at The Ohio State University Comprehensive Cancer Center, discussed the promise of the obinutuzumab, ibrutinib, and venetoclax triplet as a first-line treatment for patients with CLL. OncLive: Can you discuss the initial results of the phase II treatment-naïve cohort? Rogers: This phase Ib/II study of obinutuzumab, ibrutinib, and venetoclax in CLL is a way to study a chemotherapy-free combination. Generally, combination treatment in CLL has a very long tradition of success, including combinations with chemotherapy and CD20-targeted monoclonal antibodies, leading to very high rates of durable response. However, the side effects of chemotherapy are very difficult for a lot of patients, and there are some long-term side effects. Now that there are some newer agents, we can combine 3 agents that have very different mechanisms and toxicity profiles that do not overlap. The dosing scheme for this study starts each agent over the first 3 cycles to mitigate the side effect of tumor lysis syndrome with venetoclax. The phase Ib portion reported at the 2016 ASH Annual Meeting established the recommended phase II dose of venetoclax as 400 mg, which is the approved dose in CLL as a single agent. Since we had a dose that was tolerated, we moved into 2 cohorts that accrued parallel phase II studies. This is a cohort of previously untreated patients, so it is really exciting as it offers patients who have never been treated the opportunity to receive what we believe to be a highly effective therapy while completely avoiding chemotherapy. Thus far, we have gotten halfway through the study, and the midpoint response assessment has shown a very high response rate. One patient discontinued treatment before the midpoint so, in the intent-to-treat analysis, that was considered a treatment failure. However, everyone who made it to that point had a response, so it is very effective. The most impressive finding was the very high rate of negativity for MRD, which means that there was no detectable CLL by flow cytometry in either the blood or the bone marrow. By this traditional measure of MRD, we could not find any CLL cells—and that was in over half of patients who were assessed at this midpoint. These findings show that while avoiding chemotherapy, we were still able to achieve very high rates of elimination of all detectable CLL. Important things that we have yet to see out of this study are the primary endpoint, which is the rate of MRD-negative CR after treatment. This is a time-limited treatment strategy of 14 months, similar to some chemoimmunotherapy regimens. It will be exciting to see what all of the end-of-treatment responses are, because that is when patients have stopped taking the drugs. The progression-free survival will also be very important. Were there any toxicities that should be noted? Most of the toxicities were consistent with what has already been reported with the 3 individual drugs. The most common nonhematologic AE was infusion-related reactions from obinutuzumab. Then, we saw bruising, arthralgia, hypertension, and side effects that are known for ibrutinib. The main higher-grade AEs were hematologic, with a lot of high-grade neutropenia. That is probably because all of the drugs in the study can cause neutropenia, so those are more specific to the combination. In the treatment-naïve patients, which was what this cohort was, we actually did not see a lot of complications with neutropenia. We did have 1 person who got neutropenic colitis and bowel perforation that discontinued treatment, and subsequently died months later of late complications. It is a regimen that had substantial toxicity for at least 1 individual.